Provide a perfect promotional solution to coontain and store food for either the office at work, school or college. Branded with your company logo, our Company Lunch Box for Gift has a large 95 x 50 print dimension capable of exposing your company logo and business brand name to the maximum retention. The lunch box has been around for years, but until people used tobacco tins to contain meals in the early 20th century - was an open market to produce lithographed metal containers from the 50's onwards. 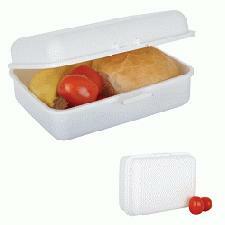 Commonly, Lunch boxes usually have a handle and are manufactured out of injection mold plastic. They are commonly used by school and college students, workmen of many varieties and are ideal to contain food, fruit, self-contained soft drinks and can be placed in a fridge for later consumption. Rich quality screen printing ensures effective full view of your brand name and corporate logo.